Have you taken a look at Compare My Spend yet? It’s the brand spanking new phone app – although you can use it on your computer, too – which analyses your spending habits, compares them to the spending habits of other people like you, and suggests areas for improvement. I posted about Compare My Spend a couple of weeks ago, and had some good feedback from thrifty readers who loved the concept and were planning to check out this free app. To enter, all you have to do is give Compare My Spend a whirl and leave a comment below, noting how the app has changed your spending habits or priorities, or given you food for thought. Perhaps you were shocked to discover that you outspend your peers in a certain category, or you have determined to cut back on your spending in a particular area? Perhaps you are thinking about rebooting your budget entirely, or perhaps you were pleased to discover that your lifestyle is relatively frugal? Whatever the outcome, I’d like to hear about it. The closing date is 5 pm on Monday 27 May 2013, and the competition is open to all UK residents aged 18 or over. The three winners will be selected by the Compare My Spend team. So what are you waiting for? When you have a few minutes to spare, give Compare My Spend a go and let me know in the comments what you took away from it. I’ll warn you in advance: the results can be striking! UPDATE: Deadline now extended until 5 pm on Monday 27 May 2013 – so if you haven’t entered already, it isn’t too late. Chop chop! We spend way less than the “average” household on almost everything – including utilities. We aren’t big spenders on things like clothes and we are about to go on our first foreign holiday in almost 8 years though. It was interesting and made me feel that our budget though tight, is working. The only problem I had was that they have apparently sent me my results by email, but the link in the email doesn’t work. If you have further problems please email as at [email protected] and we will try to help further. It said that all of my expenditures were way below average. I read all of the savings blogs on the way to work and make sure I capitalise on them e.g. Vouchers, deals to take advantage of, cheaper energy, etc. What it did say was that my saving was below average -which I’m surprise about as I try and save 25% of my net income monthly. I’m spending a lot less than the average household!! It makes me glad my fella and I don’t drive..That’s our biggest saving….We just walk everywhere…. I was pleased to see that I was underspending in a few places (mainly bills, clothing, transport) but I’m now curious at looking more indepth into our food habits. This app has inspired us to keep track of all our food expenses in June, to see exactly how much we are spending and whether or not we can find ways to cut it down if it’s surprisingly high. The app also validated our efforts of cutting back where we can, we’re definitely going to keep it up! I was surprised at how little people in my category save/spend on insurance. I always beat myself up about not saving enough and often feel a lot of guilt about it but now I’m going to try to relax with myself a little more. Am definitely overspending in the grocery department though, argh! I found it interesting to see the average spends for someone of my age and location. It was encouraging to see I was under average on everything bar two areas which are due to currently studying and thus paying for a masters degree. The app itself was visually a nice design and I like that it links back to the website for advice. However I found it very frustrating that if you made a mistake (which was easy to do on the I-phone whilst scrolling and tapping the next button accidentally) you could not go back and change it. Thus to complete took me four resets and starting again. Frustrating!!! We scored below average spending on the majority of the categories. One category that we seemed to score high on was money spent at the supermarket. Having seen this we have decided to start meal planning, as if we know exactly what we are eating then we won’t overspend on things we do not need. Growing herbs & vegetables will be put in motion soon too. This is such a handy app and has opened my eyes. I wish there was something like this around when I left home for the first time and went to university! That’s a nice looking app! I wasn’t sure if the averages given were representative of the number of people in my household or an average household. Either way I too scored below average on the majority of the categories. Rent/Mortgage was the killer for us but that’s not something we can change too much. what a super app! Great visual demonstration of spending across all areas. What did I learn? Well, although our rent payments are higher than most others our age and income, we spend way less on everything else! Utilities are much cheaper – clearly it pays to put on an extra jumper not the heating! We spend a lot less on entertainment – in fact it made me think we should treat ourselves a little more often. We’re putting double the average in savings… Goodness me – I’ve given myself a right ol’ pat on the back. Clearly the Miss-thrifty advice is working. .. I was shocked how much frittered away on snacks & drinks (ie bottles of Dr Peppa etc). We seem to spend much less than average. I turn 30 next month and am on a budget as ploughing away to pay off student loans and debt. I was pleasantly surprised to find I was under budget on everything except my mortgage and my car expenses. I’ve been thinking about ways to change these things for a while so as a result, I’m selling my car (going to use an old family one for free – yippee!) and renting my flat out for 12 months in order to streamline finances even further. By this time next year, I should be debt free (minus the mortgage) and in a much better place financially to be able to move back into my property. Thanks for the tips! ps. One thing I really struggle on is cooking for one on a budget. If you have any tips on that, I’d appreciate it! I found this really interesting. It shows how different people prioritise their spending. Our higher areas were mortgage/rent (we live in the South East so no real surprise there), white goods (we had our washing machine, diswasher and firdge freezer all break down last year – so hopefully that won’t be repeated) and tax from my husband’s wages. I spend below the average in most categories, with my savings above average, which is a good thing! I do however spend more on clothes (by around £30 for my age/region), but I’m already trying to lower this by visiting charity shops and making the best out of what I have in my wardrobe. sorry it didn’t tell me anything i don’t already know and i was wondering who has the time to phone their gas and electric provider?especially when most of them are 0845 numbers which cost a fortune? Its nice to know we dont over do it on items like food and clothing but when you break it all down like this is is shocking to see the amount spent on certain things. It came out that our rent was really high quite a lot above the national average and worryingly we are about to increase it by a considerable amount! I don’t really see how we can change that without moving to a different part of the country! It did reveal that our supermarket costs are low which I was surprised about as we shop in waitrose a lot and we eat really well! 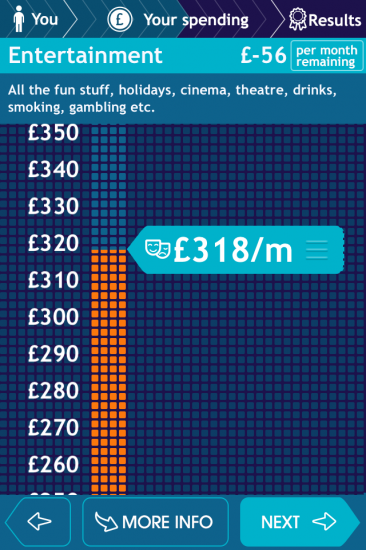 really interesting little app and it’s really good to see how our spending measures against the norm! I was really shocked at how much I overspend at the supermarket and will be looking to save money there. I was surprised that I was under spending in my mortgage and utilities as I always have a wee moan each month about how all of my money seems to go towards to bills, so from now on I will just be grateful as it could be a lot worse. I spend a lot of money on travel which there is not much I can do about as I live in the Highlands but I will try to use my bike more for quick journeys for example to get my daily paper. It was a really interesting app and once I have make some changes I will have another go and see if I have improved my spending habits. I enjoyed this app – I love anything to do with budgeting as it is an ongoing challenge for me to reduce the bills and the shopping. I was pleased that overall we are below the average budget, particularly on the food shopping, We do this by going to budget shops for certain items like nappies and dog food, I also do a food planner and reuse leftovers. Where we didn’t do so well was on savings – we still have quite a lot of debt to pay off (hence by now frugal ways) so it leaves little for savings – just £20 a month to my son’s savings account. I thought the app was easy to use and I liked the information provided. the app makes me very happy to see that i we are spending a lot less than the average, i think we save a lot by not driving and walking everywhere to be honest. Very interesting to find out where you can make savings. I am usually pretty conscious of my spending per month. I think the app is great and being able to see my spending more clearly. me & my boyfriend are consistantly struggling with the rising costs of food and its just 2 of us. we are currently trying for a baby and god knows how that will fare. although we can and will manage it scares me how much longer this can go on for. asda are by far the cheapest to shop with and we stay with them for this reason. Thank you for sharing such a great app ! Good app, like the way it looks and works.